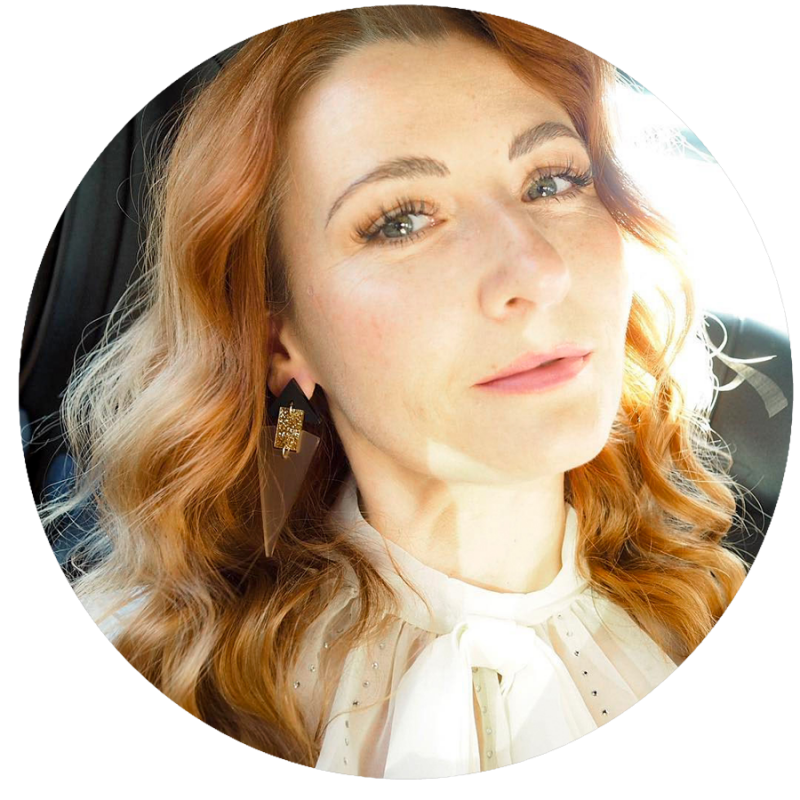 This weekend I was very brave – I went without a coat and wore a chunky knit and a faux shearling gilet instead, despite the temperatures dropping back down again in the UK. Just about everything you see here has been worn before. I have a huge collection of winter coats – when you’re a colour lover you want one in every colour imaginable, so that’s a lot of coats. Each winter I try and work my way through them all, making sure each one gets some love and fresh air at some point. I know it’s not strictly a coat, but the faux fur shearling gilet hasn’t seen the light of day OUTSIDE for a while (sometimes I wear it indoors as a quick, snuggly throw-on to keep my bod warm). 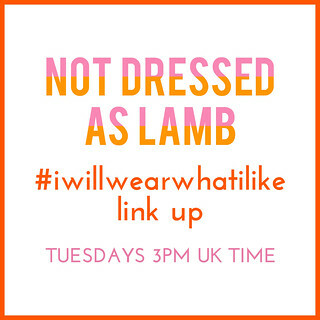 I last wore it on the blog just over two years ago (hence my want to feature it again!) and that time I styled it with a cream roll neck sweater and a vintage hat. So, a slightly different version of today’s outfit, then…! THE TRICK IS NOT JUST IN WHAT YOU WEAR ON TOP (ADMITTEDLY THE SHEARLING GILET IS A LIFESAVER), BUT THE FOUNDATIONS UNDERNEATH. 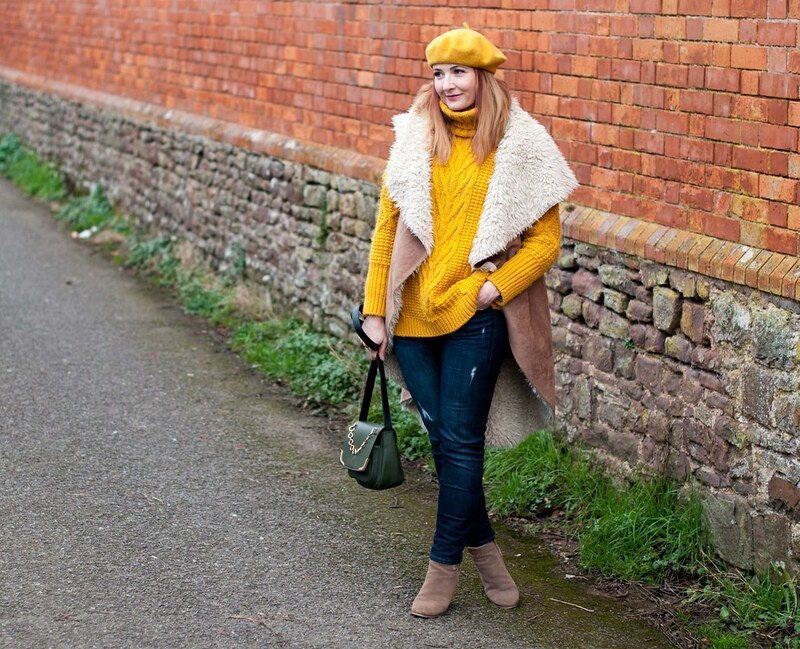 As some of you may have seen my outfit with a camel beret a few weeks ago – the first beret I’ve bought in over 20 years – you have noticed that I now have another beret in mustard yellow. 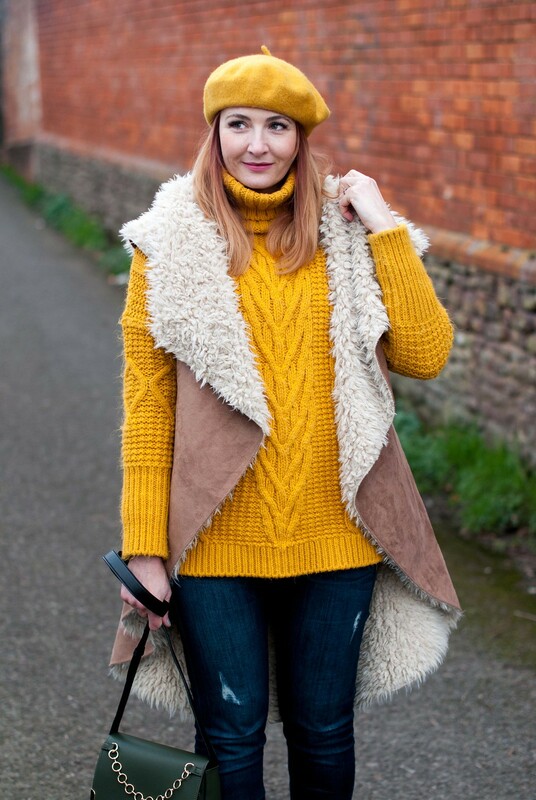 It matches the chunky mustard-coloured M&S sweater (last seen here) I bought in the autumn along with the same in deep orange perfectly. What’s the verdict I hear you cry: Was she warm enough without a coat?! Well the trick is not just in what you wear on top (admittedly the shearling gilet IS a lifesaver), but the foundations underneath. Under the chunky knit I was wearing about four thin layers, including a light cashmere sweater (cashmere ALWAYS holds all the warmth in). Combined with three pairs of socks and big school regulation-style pants (did anyone else go to a school with those big thick pants for sports??) yes, I was pretty toasty. One thing to admit to, however: I took my gloves off for the shoot. I’d just had gel nails done that morning so I wanted to show them off… the gloves went straight back on afterwards, though! No messing with that cold, me. Time to show off what you’ve been wearing! 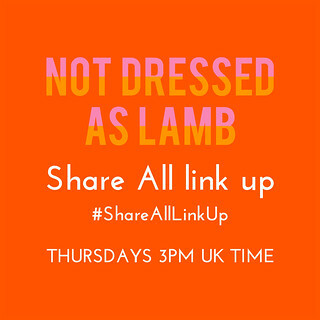 Add your outfits to this week’s link up – and if you’ve added a link to here or my button to your post you may be featured next week. DO YOU HAVE A TRICK TO LAYERING UP SO YOU CAN FORGO A COAT? COMMENT BELOW! Disclosure: This post contains affiliate links which means if you click through and buy I may receive a small commission (click here for my full disclosure). Items listed as c/o were gifted. I love that mustard colour and you look smashing in this outfit. Yes, I like a vest sometimes too, instead of a coat. But so right – layers are the secret to comfort. And hot flashes take care of the rest. !!! Wouldn’t you know, the one week I miss posting and you’ve featured me. Thank you so much for including me in your lineup! 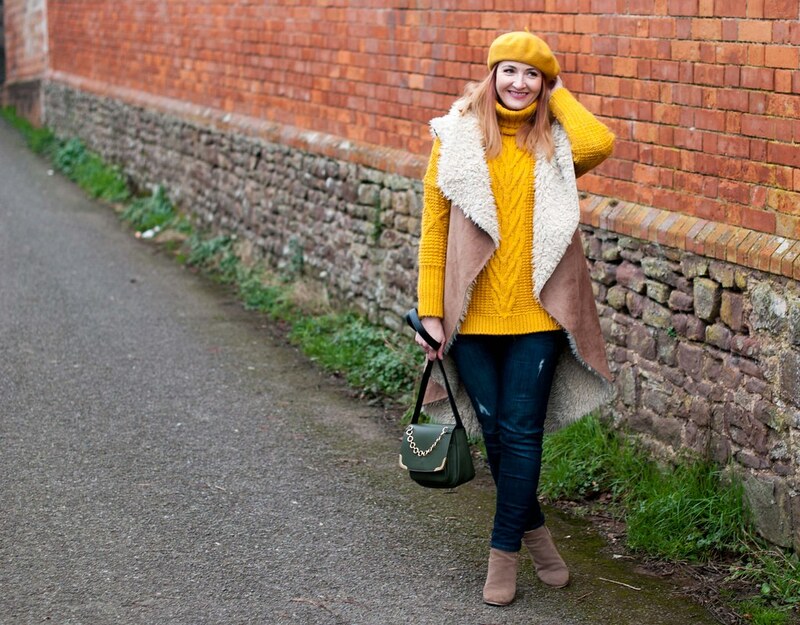 I keep hearing mustard yellow is the new millennial pink, so you are right on trend! I’ve also been looking for a fur vest (or gilet) for ages, and I’ve never thought to consider shearling. Yours looks fab—thanks for the tip! If the temperatures are above 30 I prefer to wear a vest than a real winter coat. My shearling vest is my favorite! I LOVE this outfit! The vest looks great with mustard. THAT YELLOW!!!! It looks amazing on you Catherine. And, throwing the shearling vest over it is brilliant. So glad you are feeling better. You are so cute with this adorable knit sweater, the color is pure happiness! I love this outfit!! I think I would have been plenty warm in it! Love the outfit and the colour which suits you so well. But I’d have to wear more layers as I travel a lot by bus, and yes, I’m in the UK, but standing at the bus stop I need a full-length coat! 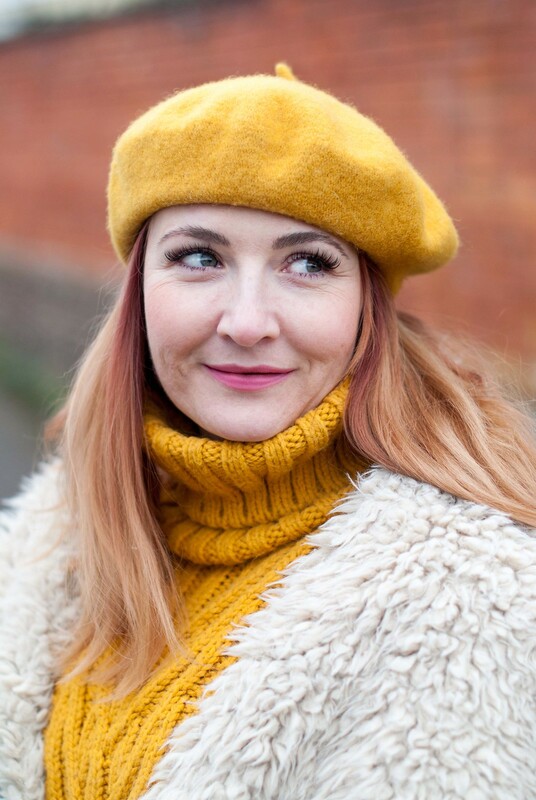 The colour of the beret is so good – I have many berets but not in that colour, which is crazy as it’s my favourite colour – I’ll have to look for one! Great post, great pics! In deed, I do have tricks not to wear a coat. However, at -25C there is no way to apply the tricks. You should wear mustard yellow more often. You looks so young and hip in that color. Great outfit! but it must have been cold in a windy moist country like the UK. That would be a perfect -10C outfit here in Interior Alaska. The shorter, squarer nails look really modern. Love the color, too. thanks Allison, though i am getting gel nails done to get them stronger and longer…! I’m keen as mustard on this outfit! I wore mustard and yellow this week too, but it was a sleeveless linen smock in eleventy billion percent humidity in Sydney. Amazing. You took something, the gilet, that would not look good on just anyone, and made it look stunning. YELLOW is the perfect match for you – I love your pictures – you are such an Inspiration. I adore this look on you! 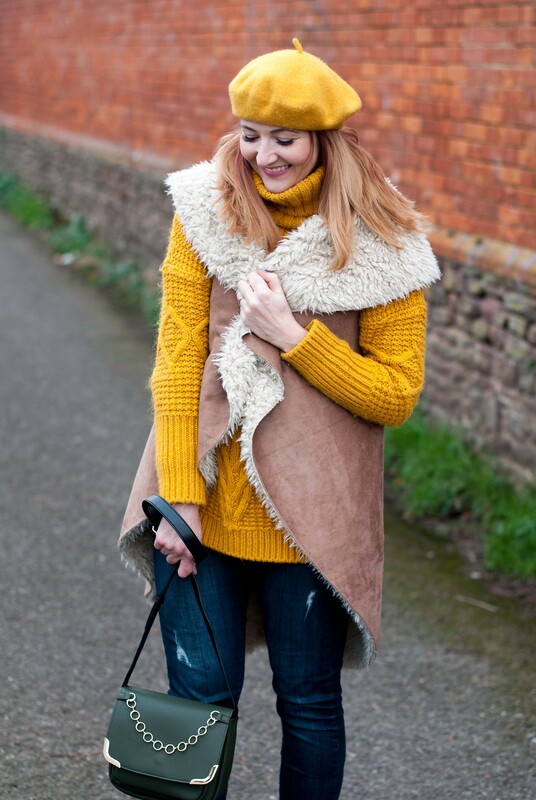 I styled a shearling vest on the blog this week, too! I really do how cozy they are. 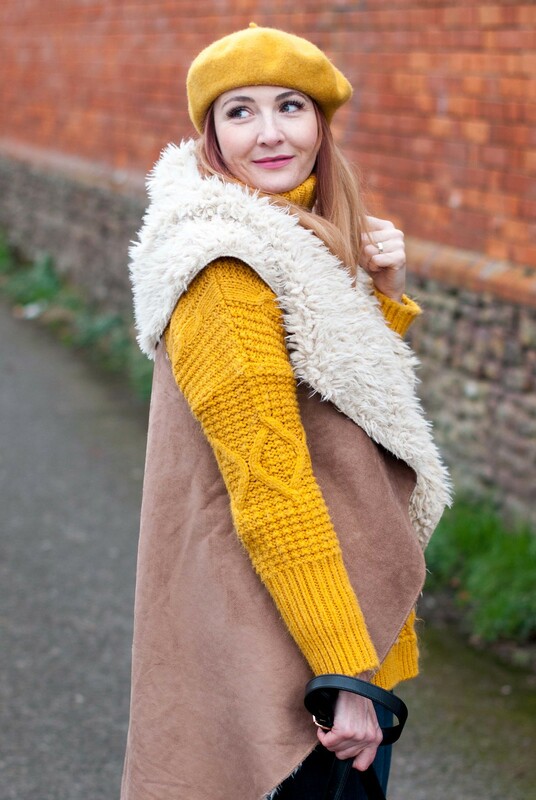 Loving the ochre too, stay warm and cosy. 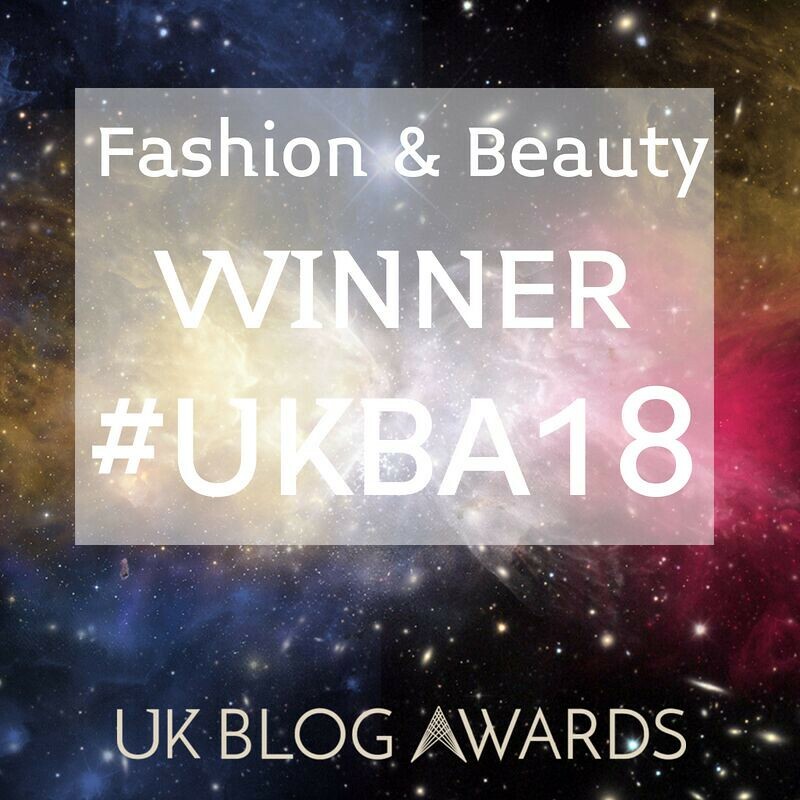 My Mum is over the moon that you picked her to feature with the other lovelies! I love this look! Cozy, comfy and cute! 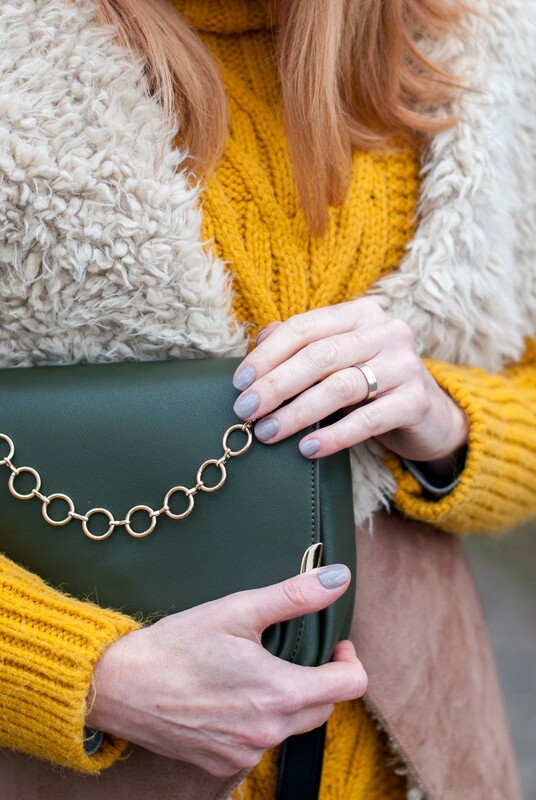 I love mustard yellow…so unexpected and bold. Love the sweater and the matching beret on you. You rock those colours Catherine. There’s so much yellow and mustard around right now. I might have to push myself out of my comfort zone and get something in yellow to brighten up my wardrobe for Spring! Thanks Steph – I can highly recommend yellow as a great pick me up…! Yellow looks very good on you! I love seeing you in your beret Catherine. 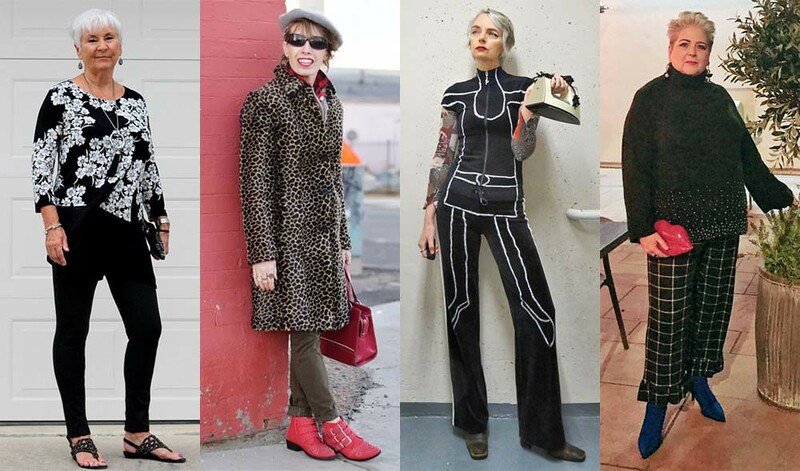 It goes to show that I wore mine too flat in my photo (and thanks so much for the feature!!). And the layering is totally key. In fact, I’ll wear hosiery under my jeans for another layer to combat the cold!! It’s amazing how all of these tricks can really help!! Thanks Jacqui – it’s no wonder they all sold out at M&S!! What a pretty look Catherine! I’m seeing a lot of yellow in posts lately! I think everyone is longing for spring. It must be super cold there, but layers are the best for staying warm. Have a great week! I’d been holding out for a mustard one from somewhere, MT – I think I bagged the last one at Asos!! Thank you so much my lovely, it was definitely an outfit that looked better in the pictures than I thought it did at the time. Catherine, I think this is one of my favourites so far! I love that mustard yellow on you and the beret suits your face to perfection. The shearling gilet is absolutely fabulous too. I’ve always loved them but they look silly on me, for some reason. Not quite sure why. Bummer, I know!